Orson Welles is the bombastic wonder boy of radio and stage. But is he also a murderer? Walter Gibson—creator of pulp superhero the Shadow—travels to New York City to collaborate on a script with Welles, star of the radio show The Mercury Theatre on the Air. The young Welles is a charming but difficult taskmaster who relishes dramatic blowouts with friends, lovers, and colleagues. 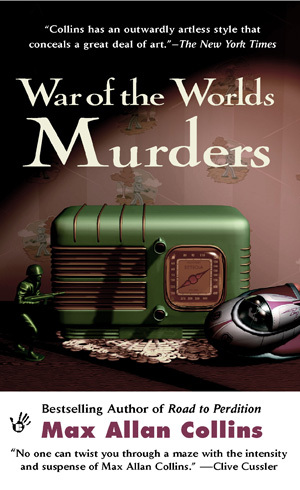 So when a dead body is found in the studio minutes before the live broadcast of The War of the Worlds, Gibson knows Welles will be the New York Police Department’s number one suspect. Gibson has exactly one hour—while Welles is on the air enacting the infamous hoax story of a Martian invasion—to find the real murderer and clear the radio star’s name. 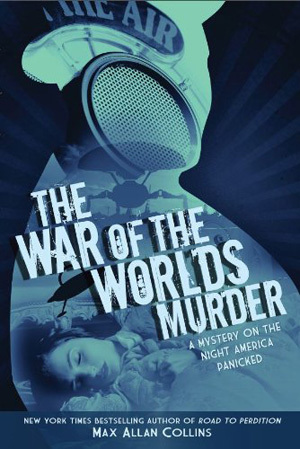 With its brilliant reconstruction of the broadcast that hoodwinked the nation, The War of the Worlds Murder is a paean to radio’s golden age. War of the Worlds Invasion: "a fantastically well-written novel, weaving fact and fiction together in a seamless fashion"
Bookgasm: "well-researched, immersed in the period and simply a metallic tripod creature’s worth of fun." My Reader's Block: "Historical and anecdotal details are superb. The tale of the panic-inducing radio broadcast is quite interesting. And exciting--as Collins takes us from snippets of the broadcast to scenes from the world outside the broadcasting studio."